A correction to this article is available online at https://doi.org/10.1057/s41289-019-00091-9. 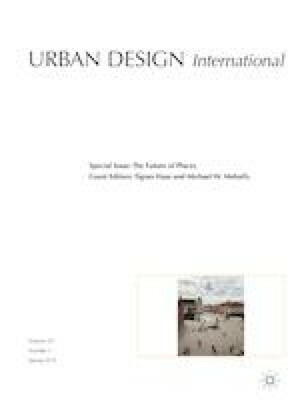 In an important sense, this special issue of Urban Design International has been aimed squarely at the current global urban agenda as outlined in the United Nations’ 2016 Habitat III conference. More particularly, it has been aimed at the emerging focus on public space, in Habitat III and elsewhere, as a central problem for modern urbanisation. As several authors herein have noted, the world is urbanising at an unprecedented rate, and public space, or its decline, looms large in the process. In this concluding and summary essay, we pause to consider the evolution of the key role of public space what is now called the “New Urban Agenda”—the UN’s outcome document from the Habitat III conference. Over the past 40 years, the global urban agenda has undergone a significant transformation. Following a period of immense urban growth during the 1970s, cash-strapped local governments around the globe were tasked to come up with innovative solutions to cope with the overwhelming challenges faced in urban areas—lack of affordable housing, rising traffic congestion and growing informality to name a few. Nowhere were these challenges greater than the rapidly urbanising cities of the global south. Regrettably, at the time, there were hardly any global forums or platforms for collaborative dialogues to discuss such paramount urban issues. Growing concern eventually led to the establishment of the United Nations Conference on Human Settlements (Habitat I), held in Vancouver, Canada in 1976, which eventually resulted in the adoption of the Vancouver Declaration on Human Settlements. This outcome document was directed towards addressing what were considered to be the most formidable threats to urban areas at the time—a growing housing deficit, and the exclusion of a large proportion of the population from access to essential basic services. Nearly 20 years after this landmark conference, member states reconvened in Istanbul Turkey in 1996 for the Second United Nations Conference on Human Settlements (Habitat II). It became evident during Habitat II that the decisive nature of cities was not restricted to that of access to housing and basic services, but that issues of governance, transportation, employment and education also mattered and were all deeply intertwined. This wider mandate, alongside the newly defined sustainability agenda that arose out of the 1992 Earth Summit in Rio de Janeiro, would come to define the newly adopted Istanbul Declaration of Human Settlements. Nearly 40 years on, it is not easy to assess the success or failure of these previous agendas. Although there have been significant wins (i.e. between 2000 and 2015 more than 320 million slum dwellers have gained access to improved water sources, sanitation facilities and durable housing—achieving MDG 7.D), there have also been dramatic shortfalls (i.e. during the same time, the absolute number of slum dwellers had increased from 792 million in 2000 to 880 million by 2015). When member states reconvened in Quito, Ecuador last year for the Third United Nations Conference on Housing and Sustainable Urban Development (Habitat III), the discussions arising in official sessions and in the corridors during the breaks between were very different than those of the past. For the first time, the discussion was not solely focused on the quantitative supply of hard infrastructure, but instead a growing recognition of the importance of qualitative indicators that define the livability and well-being of cities. Arguably, at the centre of this recent shift in mandate has been a public space agenda. This is because public space has proven to offer a wide range of benefits in the form of ecological diversity, creative and economic exchange and dynamic social interaction. Today, as we stand in the early years of an urban century, we may not have the solutions to many of the most urgent problems, but we can find comfort in the fact that we better understand what it is about our cities that we value most. Today we know that cities should not simply be viewed as ‘physical manifestations of economic growth’ as defined by previous agendas, but that they are also ‘vibrant social ecosystems’ defined by the opportunities and chance encounters that they present. It was this idea that united those behind the public space endeavours of the ‘Future of Places’ initiative nearly 5 years ago, and it is this idea that has again united the scholars in this special issue. As our colleague Tigran Haas also described in the introduction, that initiative was a 4-year partnership of UN-Habitat, Project for Public Spaces and Ax:son Johnson Foundation, its NGO host. The forum of conferences, side events and papers brought together over 1500 researchers, practitioners, officials and activists, representing more than 700 organisations, 275 cities and 100 countries from all around the world. Its participants, including most of the authors of this special issue, sought to articulate the challenge of public space as an element of the New Urban Agenda. The series led to the current Centre for the Future of Places at KTH Royal Institute of Technology in Stockholm, where the authors of this essay are also based. As the result of these and other efforts, the New Urban Agenda prominently addresses the central role of pubic space as an essential component of urban structure (discussed at length in eight separate paragraphs). As the Agenda moves into implementation, its broader social, economic and ecological goals are seen as increasingly dependent on public spaces that are adequate, safe and inclusive. For this reason, an incomplete picture of public space—as we have had up to now—poses a significant problem for implementation. In that light, all of the authors in this special issue have raised important questions about the nature of public space in contemporary cities—questions that, given our current challenges, require more satisfactory answers. At the same time, our understanding of the key issues of public space is getting clearer, thanks to these authors and others. Over the last several decades, public space has become an increasingly active and fruitful subject of research in its own right. For example, we understand much more clearly how public spaces help to generate economic spillovers, how they provide important affordances and capacities, and how they create demonstrable benefits of ecological, social and personal health. What is needed at a minimum is a shareable framework of understanding that, while not answering all the remaining questions, clearly establishes the known benefits, and provides pragmatic methodologies for achieving them. From there we can continue to pursue the remaining questions, without delaying the necessary and urgent progress needed in implementing the New Urban Agenda. Following is a partial list of four broad categories of questions as highlighted by the authors herein. We can hope that they, and perhaps also other readers of this journal, will be able to make more of the necessary and timely progress needed on research in these topics. 1. How important are public spaces as engines of human well-being, economic development and social justice, and what are the threats to them, especially from private interests? Ali Madanipour points to a renewed interest in the documented benefits of public space, but at just the historical moment when shrinking public sector budgets are increasingly replaced by private sector investment and control of the design and management of public space, often with markedly unequal benefits to the city’s residents. Setha Low also points to a worrisome diminution of the capacity of public spaces to promote social justice and diversity, replaced by a “politics of exclusion”. Vikas Mehta looks at streets as important arenas for social interaction and recreation among diverse people, which are “crucial to well-being, sense of community and civility”—but they must not be over-regulated to become “sanitized, gentrified and fortified”. 2. What are the key structural characteristics of public spaces and their private edges? All of the authors deal, to some extent, with questions about the necessary structural properties of public space. Matthew Carmona asks, is spatial enclosure a necessary characteristic of public spaces? The evidence he finds suggests that it is helpful, but not necessary. Both Mattias Kärrholm and Matthew Carmona consider the importance of a clear delineation between public and private, finding somewhat different answers: Carmona thinks a clear delineation is essential, whereas Kärrholm thinks some ambiguity is helpful in the self-organisation of public space by varying actors. Mattias Kärrholm also hints at the multiple scales of public space within the city, an important topic that seems to need further attention. 3. What are the processes through which public spaces are created and managed, and what are the necessary roles of different constituents—particularly those in the private sector relative to public and civil sectors? Matthew Carmona describes some of the common processes, and the effects of regulation upon their outcomes. He also asks what types of public spaces are needed and where, and how rights and responsibilities for public spaces can be safeguarded by the public sector and others. Mattias Kärrholm points to the need to assemble actors at different scales in the production and maintenance of public space. Ali Madanipour and Setha Low again warn of the danger of unequal access when private sector actors have increasing control over public spaces. 4. What tools and strategies are required to create and maintain successful public spaces? Aseem Inam describes an instructive case study from Toronto, and concludes that it is necessary to engage informality as “political empowerment, in which the design process can be a vehicle for fundamental change”. Ali Madanipour points to the increasing difficulty of public sector funding, and the need for new mechanisms to monetise public space—which bring their own dangers for the subtle erosion of public space access. Mathew Carmona warns against a “one size fits all” approach, and points to the need for diversity in tools and strategies for creating different kinds of public spaces. Mattias Kärrholm discusses the need to address territoriality and scale as spatio-temporal phenomena, that is, as occupied spaces within the overall structure of the city as it evolves in time. All of the authors raise questions about how the various actors who produce public space can be engaged to improve the quality of public space. To one degree or another, all of the authors point to successful tools and strategies—but many questions still remain. These questions do helpfully point to the needed research agenda ahead, and one that the Centre for the Future of Places and other interested parties can now take up with greater clarity and purpose.